Red, white and blue. 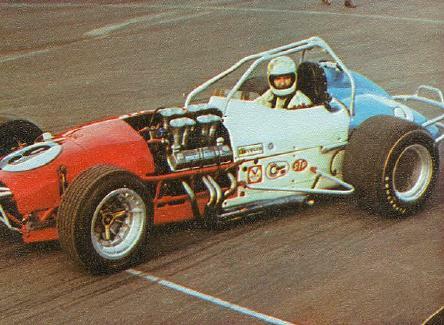 Here was a special Gioia paint job on the #9, driven by Joe Hlywka, picture from the 1971 racing calendar. He drove the #9 from '69 to mid '71 and finished right up there. All of the photographs we have of Joe in the #9 are already framed, but I know there are a number of them to be seen in old copies of the Eagle. 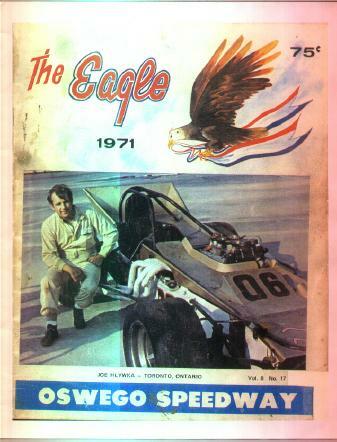 On this moth-eaten cover of the Oswego Eagle is a picture of Joe with his newly built 06 car in 1971. The car had a lot of potential and made a great showing over the next year or so. Joe suffered his first heart attack before the start of the 1971 season at the age of 39. If he could not drive, he could still be actively involved in the sport with his 06 and John Spencer at the wheel. The Pink Panther was drawn by Marg Hardman, a close friend of the family. 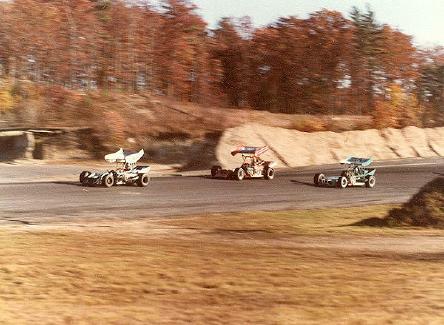 Here's a shot of the 23 car in October 1978, taken at Winchester, Mass, with John Spencer at the wheel. Here's a shot taken at Thomson, Conn. In the Fall of 1978. 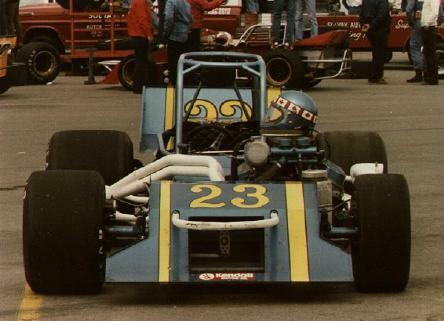 The 23 was a competitor with Spencer behind the wheel.